I don’t know about you, but I know started reading novels in Chinese way too late. This was partly because I thought it was scary and more difficult than it actually was, but also because I lacked a good approach and a strategy to overcome the difficulties reading native material implies. Looking back at how I learnt English, it strikes me that there is a powerful way of getting used to reading novels in a foreign language, namely to reread something you have already read before and like a lot, but now you read in the target language. We have perhaps left the times when comprehensible input was a buzzword, but it’s still a powerful concept when talking about listening and reading. Simply put, it means that you benefit most when you understand most of what you read or listen to, which will enable you both to solidify what you already know, but also to easily learn the few things you didn’t know. Please read this article for more about comprehension-based learning and teaching. However, if you’re aiming for near-perfect understanding of a written text before you attempt to read it, the likelihood is that you will never get to a stage where you can read a novel. Understanding almost everything is not a requirement for learning or enjoyment, of course, it’s just the more you understand, the more these are boosted. Fortunately, there are many things you can do to scaffold your learning and make the text easier. As independent language learners, though, we can’t really make use of some common methods such as creating word lists, creating interesting preparation tasks, substituting difficult words for easier ones and so on, because they typically require a teacher. However, one very effective way of reducing the difficulty of a text in Chinese is to be already familiar with it before you start. Not ready for a novel yet? The method described in this article works for all lengths of texts. You can read a short news article in English first and then read the same article in Chinese. Another place to check out is the Marco Polo Project, where enthusiasts translate articles from Chinese into various languages (mostly English). I started learning novels in English with Robert Jordan’s The Wheel of Time fantasy series. This was when I was twelve and realised that it took ages for the translator to translate new books into Swedish; I simply didn’t want to wait that long. I had read a few books and wanted more, but rather than wait a year or so, I decided to read the series in English. To reduce the shock, I decided to read from the beginning, including the books I had already read in Swedish. This turned out to be a very good idea indeed. Reading a few books in English covering what I had just read in Swedish was a really good way of scaffolding my English reading, making it a viable project even though my English wasn’t up to the task at the time. The fact that it then took the author fifteen years to finish the series (or, rather, for him to die so someone else could finish it for him) isn’t my fault. Why is it a good idea to read the Chinese translation of a book you have read and like in English? You know for a fact you like the book. Naturally, you should choose a book you want to reread, perhaps something you read and loved a long time ago and want to experience again. Action-packed adventure novels are great. This guarantees that you’re motivated to read. No-one can recommend books to yourself better than yourself. If you choose a book I have read, you might simply not like it, which will severely reduce your motivation to read it. You have already read the book, so you know what it’s about and you know what’s going to happen. Your task is to see how this is expressed in Chinese. You will not encounter characters you don’t understand, a setting that makes you confused or subtleties in the plot you overlook, because you know most of this when you start reading. If you’ve forgotten, you can always read a summary online (Wikipedia is your friend). If your Chinese is already quite good, you can skip this step and re-experience books you’ve mostly forgotten but don’t really wan to reread in English. You avoid regional, dialectal and stylistic language, as well as cultural references you might not get. Normally, I would say that reading about culture in a rich and varied language is a good idea, but it can be overwhelming for someone who has never read a novel in Chinese. For instance, wuxia novels that take place in ancient China aren’t written in a language you can transfer directly into your everyday Chinese and many novels set in modern China are written with a certain style that might not be familiar to you at all. Of course, you need to learn about these aspects sooner or later, but you will have enough of a challenge facing the basic language of the novel. Simply put, reading a translated novel is easier. Thus, reading your first novel in Chinese turns from impossible to merely difficult. It will take hard work to get through (depending on your current level, of course), but it’s definitely easier to do it this way than choosing random book your Chinese friend recommends to you. You should be aware that some translations aren’t very good (in fact, some are terribly bad). I don’t mean that they are bad in the sense that the translator fails to capture the soul of the original novel and used another language to express it expertly, instead I mean that the Chinese in the translation is not good. This is probably because the translator was paid too little and just rushed through, translating sentence by sentence, sometimes even word by word. Therefore, when reading some translated novels, you can feel the English behind the sentences. Obviously, this is bad for us as readers, especially if we want to learn Chinese along the way. That translated novels will not sound exactly like first language novels is only natural, and I don’t think that’s a problem, but at least the language should be natural and correct. The best way of checking this as an intermediate learner is to simply ask a native speaker, preferably one who reads a lot, and see what they think. Remember, you’re not really interested in the quality of the translation; what you want to know is if the Chinese is good or not, so just let them read a few pages and ask what they think about this as potential reading material. If you buy books online, there are usually previews available you can use for this. Also, note that reading your first novel in Chinese is about reading practise. It’s about understanding words, piecing them together into sentences and get the general idea of what’s going on. This is not the time for memorising sentence patterns and detailed studying of syntax. This might be obvious, but choose a novel that is interesting for what happens or because who’s in it rather than because the way it’s written. Action, mystery, adventure and fantasy stories are all very good. 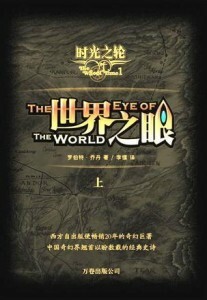 In order to close the circle,I’m now rereading The Wheel of Time in Chinese. Naturally, it isn’t my first novel in Chinese, but it’s still interesting to return to a series I never finished as a teenager, now in a new language. I don’t think Robert Jordan is a great writer in general, but I am interested in the plot. The curiosity over how the series ends keeps me motivated to read the next page. It remains to be seen if it keeps me motivated through ten thousand pages, but it’s worked well so far! I tried reading Twilight in Chinese. The first page had about fifteen cheng yu. I gave up. That makes me think of something I could have mentioned in the article: Sometimes the difficulty of the novel in the original language is unrelated to the difficulty of the novel in Chinese. Some authors write great novels in simple language, but some translators seem to think it’s a competition of who write the text with the highest density of literary expressions, including chengyu. Often, though, it should be possible just to skip them and understand what’s going on anyway. Great post! Right now I’m reading my first novel in Chinese, 穿条纹衣服的男孩，that is, the translation of “The boy in the striped pyjamas”. I hadn’t read it or watched the film before, but it’s set in WWII, so the story sounds familiar, and it’s narrated from the boy’s point of view, so the language used is pretty easy. In only three days I’ve read half of it, I strongly recommend it as a first novel! I haven’t read that one either in English or Chinese, I should perhaps give it a try! My best suggestion for first, translated novel would probably be Paulo Coelho’s The Alchemist. Admittedly, I haven’t read it in any other language, but the story is engaging enough to never become boring, even if one reads slowly. Definitely good tips here, but I’m disappointed that there’s no mention of graded readers! Graded readers enable learners to try to start reading for enjoyment way earlier than they would otherwise. Chinese Breeze and Mandarin Companion were not around when you and I were at that level in our Chinese, but learners just starting or at the elementary/intermediate level should definitely make use of these resources. Hi John! I think graded readers are great, the goal with this article wasn’t really to tell people how to get to the level where they can read their first novel (which definitely involves graded readers), but rather to help people choose a novel they have a better chance of understanding. I would argue that any normal novel, translated or not, are many time harder than any graded reader, so the goal is a bit different. I will, however, write more about graded readers in future articles! Thanks so much for mentioning Mandarin Companion, John! I’ve downloaded samples of all 5 titles and am trying them out before deciding which one(s) to buy. I also bought 3 of the Chinese Breeze titles and finished 2 of them – good, but a bit repetitive and not available as ebooks. The Mandarin Companion series is an excellent choice, and they are made to order for reading on an iPhone or iPad – the iOS has several free built-in foreign dictionaries, so I installed the Oxford Chinese-English dictionary, which enables double-clicking characters to bring up the definition. Cool! And I’ve been supplementing that with my tried and true PlecoDict, in which I’m also creating flashcards based on the Mandarin Companion vocabulary. Keep the titles coming! Olle, cool tips!Any thoughts on which languages translate better into Chinese? It depends on the quality of the translation, of course, but not only. For instance, I love all of Haruki Murakami’s books but I’ve found they’re usually much more engaging when translated in English than in French. I’m afraid my sample size is to small to comment, really, I have almost only read translations from English. My guess is that the skill of the translator and the time invested in the translation are much more important than source language. I’ve also noticed that novels that are easy to understand and written simply in English can become much more complicated in Chinese. I had this experience with Animal Farm which was written in a very simple style in English, yet the Chinese translation became quite literary and full of fancy expressions and literary words no one would ever actually say in real life where something easier would have sufficed. I’ve greatly enjoyed re-reading many of my old favourites in Chinese. I think this is part of a much more general trend. It seems that in Chinese, using complicated and literary language is associated with being a great author to a much larger extent than in English. There are numerous great authors in English who are famous for writing simple and yet brilliant fiction. They probably exist in Chinese, too, but my guess is that it’s much rarer (perhaps a native speaker who has read much more fiction in Chinese than I have could comment on this). This would explain how a simple novels turns into a complicated novel in Chinese, because otherwise it wouldn’t be considered to be good. That author in Chinese would be Gu Long … who incidently was inspired to write in a simpler style because of the influences of writers such as Hemingway, Jack London, etc (he studied foreign literature in university). I`ve also read that he was inspired by the fact that he was paid per page, not per word, and that he could fill up a page faster with short sentences and paragraphs. Your article has come just at the right time for me. I never really set a goal of reading a novel in Vietnamese but flipping through one in the library last week I realised my level seems about right to try. The only translated story I have access to is The Little Prince which may not be my first choice but at least I know the story which puts reading it in the realm of possibility, and hopefully a gateway to other things. Thanks for the nudge! This is a great idea! I began reading English language novels I enjoyed from high school when I began studying Spanish in college. I’ve tried to do the same with Chinese now, but it’s proving a bit more difficult than I imagined. I decided to read a Game of Thrones novel in Chinese but some of the character names are not always recognizable from the translation, and I have trouble finding some more arcane nouns in common dictionaries (what’s the Chinese for pauldron? ),so it’s been fairly slow going. My ideal situation would be to find a digital 对照 type text with one page of English content and one page of Chinese content so that I could quickly check back on a characters name, for example. Any tips on online projects or other resources for these types of materials? Living in Taiwan has its advantages. I dropped by a local bookstore for a look at Chinese novels to attempt to read. I really don’t think much of translations of Western novels as it is difficult to appraise the quality of the translation. I suspect that these might be best to avoid if at all possible — though I do have some Agatha Christie novels in both Chinese and English that I let my English students borrow. So I got to the bookstore, looked at the Chinese novels and slowly migrated into the elementry school section, where the texts have BPMF phonetics along side the characters. I guess I am just not ready to drop the training weeks. I ended up with “An Elementry School Model Diary” that seems to not have me buried in a dictionary for every phrase. Olle, these are great suggestions. Are such translated novels available as ebooks and if so, where can one find them online? I was thinking of looking for James Hilton’s List Horizon, which would seem appropriate and would be fun. Make that “Lost Horizon” of course! (both link to Amazon searches for these series). Note that I haven’t really tried these yet. Some of them might be too easy for you, but even books with a lower word count might be good since they don’t necessarily use the words you have learnt. I must be one of the few who doesn’t have a friend who’s willing to come to a bookshop with me and read a few pages of a dozen books. Can anyone suggest a more practical way to check on a books quality? Be creative. You can easily just take a picture of one page from each book and then ask someone online? Using a “pop up dictionary” such as Wenlin on a computer or Pleco on cellphones helps a lot to read chinese novels without being stuck by one’s lack of vocabulary. It’s really easy to download Chinese books for free on the internet. Reading translated novels can be an option at first. You can also consider reading essays that tend to be easier to read than novels once you master the specialized vocabulary of what the essay is about. I think that you want to try to read proper chinese novels and not translations as soon as you can, as translations sometime don’t feel like proper chinese language, and that you can tell it has been translated. One thing to mention is that it’s difficult to find material that is both interesting to read and that you can read (if it’s easy to read it’s boring, if it’s interesting, you might not be able to read it…). That’s an argument in favor of reading translations actually. Thank you for the recommendations! I haven’t read either of them. Would you mind trying to sell them to me (and others) with just a sentence or two about them and why they are interesting? Those two books and those two writers are very famous, lots of information can be found on the internet about them (not only in Chinese). From my perspective reading books in Chinese is not only about improving my Chinese it’s also about understanding better Chinese culture and progressively being able to read proper Chinese literature. I began reading in English for exactly the same reasons as you and with exactly the same fantasy series ! For some reasons, I did not take the same leap with chinese. Definitely have to try ! What a coincidence! Are you learning simplified or traditional? The Taiwanese translation of the series is actually very good. I have verified it with a number of different native speakers and they all say it reads naturally in Chinese (except for the weird names, but that’s unavoidable). Some food tips Ollie, keep up the good work. I found contempory writers like 三毛 very accessible. Written in everyday language and real life (mainly her’s)situations. 读者 is also good. Too hard for non-native high school students, but advanced uni students should be ok, with a good dictionary by there side. Chinese teenagers like me like spending their free time reading Internet novels. There are easy-reading and interesting. Also, they are long enough to kill lots of time, although they can hardly be seen as high literature quality. In fact, I think that fewer and fewer Chinese spend time reading trational novels (instead of Internet novels) because they are tiring to read and boring to many people. I agree with the recommendations for the author Yu Hua. Good points: Relatively easy language. Interesting, maybe even weird, stories. Teach you about everyday life in China during the 20th century. Drawbacks: Can be hard to get into the stories since they are a bit weird. You need to keep reading past the first pages! The first Chinese book ever I managed to finish was an Agatha Christie book. I knew the main characters, and since it’s a detective story I kept reading because of the suspense. Though I think translated books can be quite hard to read, since the language quite often doesn’t follow the flow of the Chinese language and the names are a pain to keep track of. I also recommend the book 城南旧事 by author Lin Haiyin. It’s written in a very naive, childish language, which makes it an easy read, but the subject of the book is quite difficult, so it’s very rewarding in that way. Now I’m trying to get into Internet novels. I’ve been reading 双城 by author 苍月. It’s an epic fantasy story. It’s quite exciting since I get the same feel as when I was a teenager just discovering fantasy books, at the same time it’s very challenging since a lot of words are related to magic and hard to find translations of.